Botticelli Calumny of Apelles is a famous painting on display at the Uffizi Gallery, executed by Sandro Botticelli in 1495. Like many of the early paintings by Botticelli, this is an allegory: a great tool to communicate a hidden message, meant to be understood only by people with a high level of culture. Botticelli is considered one of the absolute masters of painting. Together with some of his illustrious colleagues, he was lucky enough to be born and spend much of his life in the right place at the right time: Renaissance Florence. In the Renaissance, all art forms flourished again, art is renewed through new ideas, new techniques developed by those who today are the artists who entered into history and legend. Masters like Botticelli, or like Brunelleschi, Giotto, which were then followed by the likes of Raphael, Leonardo da Vinci or Michelangelo Buonarroti to name the most famous. 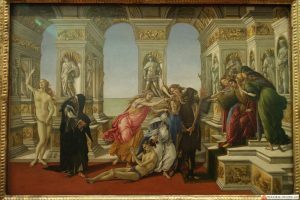 Among the works by Botticelli, there are several allegories that art historians recognize as the absolute masterpieces of Italian painting, like the Birth of Venus, La Primavera, Pallas and the Centaur. Botticelli Calumny of Apelles is an allegory of slander, made on a wooden board sized 62 x 91 cm. It’s a work made with tempera, the traditional technique used by Florentine painters, which, thanks to the contribute of the Flemish school, will soon be replaced with oil colors and canvas. In this work Botticelli is trying to reproduce a work by Apelles, the legendary ancient Greek painter whose works, all lost, have been described in detail by Roman writers. Looks like Apelles painted an allegory of slander after having been accused to be a traitor of the king. Botticelli did the same after being accused (by a competitor) of being homosexual. In Renaissance Florence, homosexuality was not a problem for the upper classes, but actually it was prohibited by law and given the influence of the Catholic Church it was possible to be condemned to death because of this. The scene painted in Botticelli Calumny of Apelles represents some people who are in a large hall with a magnificent classical architecture. In the background, you can see three large and monumental arches that hint at a seascape with a clear sky. We see the statues placed in various niches of architecture that seem to participate in the animated scene of the group of the main characters at the center. On the right, we see King Midas (with donkey ears) who is listening to two villains. These two characters represent ignorance and suspicion. Before the king, we see the envy dressed in black like a beggar with the cap and has a raised hand as a symbol of great solemnity and indicating the king. This strange man held tightly by the arm, a female character, slander represented by a beautiful and vain woman who is styling her beautiful hair from two other women representing fury and wrath. The Slander holds in one hand a torch, but no light as a symbol of a false knowledge and with the other hand pulls the innocent by the hair while the unfortunate slandered is represented almost naked while holding hands together as in prayer. The latter is almost forcibly brought before the King Midas. On the left of the painting, we see two more characters that represent repentance, depicted as an old hooded almost stunned by the events, looking at the naked truth indicating the sky as the source of true justice. It looks like the Botticelli in this work he wanted to communicate some sort of complaint to all the wrong values, all the limits that the mankind always had, but it was also linked to his feelings after being accused. Luckily for Botticelli, he was judged innocent, but anyway, this work was his last secular painting. Probably scared by this event, and influenced by the preaching of Girolamo Savonarola, Botticelli will have a transition to a different style and won’t be the same “painter of beauty” anymore.